Whilst problems aren’t the only drivers for change they are an important factor. Understanding the problems that the business and its customers experience can help ensure you have clear and concise requirements that will address the problem that needs to be solved. A problem statement can be defined as a concise description of an issue that needs to be addressed by a problem solving team. Defining the problem clearly upfront can be a real aid to the problem solving analysis that follows. Let’s consider the attributes of a well-framed problem statement. A problem must be measurable in terms of quantity, frequency and the population affected. One of the ways to verify that a problem has been solved is to measure the results after the fix and compare them with the initial metrics in the problem statement. The problem must describe the impact on the business and or the customer. This helps the Business Analyst write requirements that are focused on the business and or customer needs. Metrics and impact together provide evidence that the problem needs to be solved and needs to be solved now. The problem must indicate what process activities relate to the problem. Inclusion of the process activities make it possible for the Business Analyst to work out the people and systems impacted by the problems (if not also specified). This enables the BA to establish the scope of the requirements needed to resolve the issue. 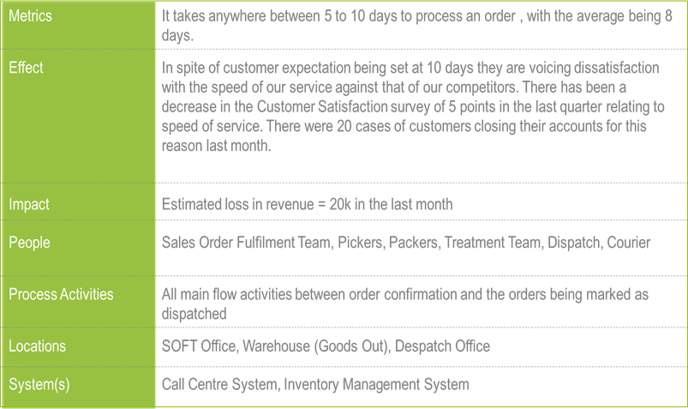 “The customers are not happy that they are not receiving their product in a satisfactory time and so the speed of the delivery service must be increased to stop customers having to wait too long for their product." With some further investigation you may find some valuable information to help define the problem statement. An accurate problem statement will save time and effort by focusing the team on root cause identification. Continuous improvement happens when root causes of the problem are found and permanently eliminated. Defining the problem statement is the first step in this process.